The incredible experience of the XV International Tchaikovsky Competition continues on medici.tv: watch the second day of the Final Round of the Piano Competition live. Two of the six young pianists selected to play the Final Round will perform on the stage of the Great Hall of the Moscow Conservatory! For the first time, medici.tv is the official partner of the Competition and has broadcast all the performances and more during the XV International Tchaikovsky Competition, live from Moscow and Saint Petersburg. For the occasion, medici.tv has created a brand new website: http://tch15.medici.tv. The main website medici.tv is also broadcasting the Opening Concert, the Final Rounds, the Awards Ceremony and the Concerts of the Laureates on medici.tv! After the last two weeks, making it through two rounds of selection, the pianists must now give their all in the Final of the Tchaikovsky Competition. Six pianists have prevailed to the Final: Sergey Redkin, George Li, Lucas Debargue, Lukas Geniušas, Daniel Kharitonov and Dmitry Masleev. 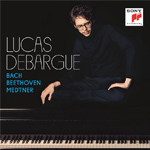 For this second day of the Final Round of piano, Lucas Debargue performs Tchaikovsky's Piano Concerto No. 1 in B-flat Minor, Op. 23 and Liszt's Piano Concerto No. 2 in A Major, S. 125. Lukas Geniušas then performs Tchaikovsky's Piano Concerto No. 2 in G Major, Op. 44, then Rachmaninov's Piano Concerto No. 3 in D Minor, Op. 30. They are accompanied by the State Academic Symphony Orchestra of Russia "Evgeny Svetlanov" conducted by Alexey Bogorad. The announcement of the winners will be broadcast live from the Awards Ceremony on medici.tv on July 1st and on http://tch15.medici.tv On July 3rd, following the Concert of the Laureates in Saint Petersburg, the Grand Prix will also be award to one of the candidates... More information on http://tch15.medici.tv. Pictures: Lucas Debargue (left), Lukas Geniušas (right). Broadcast date: June 29, 2015, 5 p.m.